The Interest Rate are increasing while the outlook for the economy are getting stronger and the inflation is expected to follow the rate in the coming months. The FED, meeting for the first time under Chairman Jerome Powell, raised the funds rate to 1,5 – 1,75 percent during its March meeting. FOMC holds eight regularly scheduled meetings during the year and other meetings as needed. Their next meeting is May 1 – 2, 2018, and GDP, Interest Rate and Inflation is on the table. The economic outlook is improving and the FED officials has recently projected a steeper path of hikes next year and 2020. 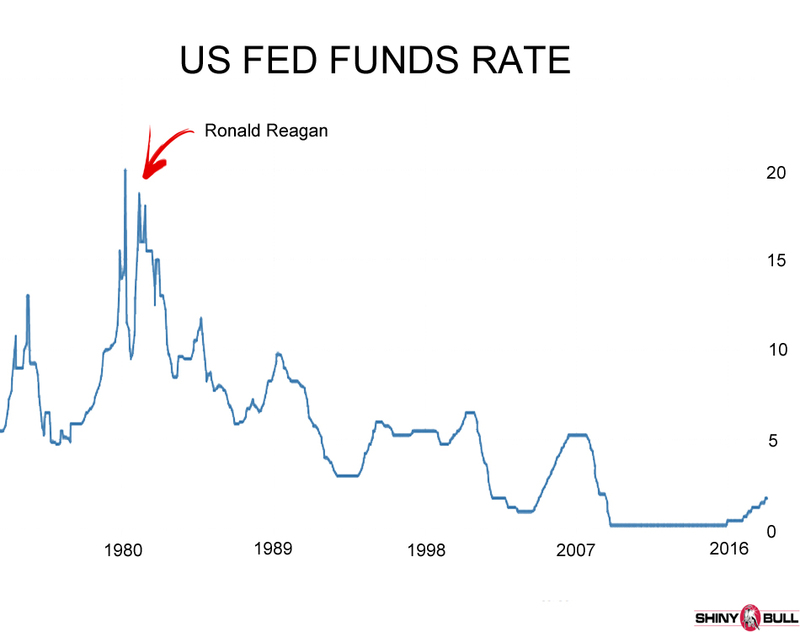 The FEDs funds rate was extremely volatile when Ronald Reagan entered the White House in 1981. In the early 80s the rate peaked at 20 percent and plummeted to about 10 percent and then back to nearly 20 percent again. That`s what I call action. During the period of Ronald Reagan, the rate went from 20 percent and down to 10 percent in 1989, when Ronald Reagan said welcome to the next president; George Bush. He succeeded to push down the rate even more, but it hit a record low of 0,25 percent in 2008. That time is for now over. The increase in March was the sixth rise since the central bank began a tightening cycle back in December 2015. As the economy has strengthened, the FED has upped the pace of hikes. After the FOMC meeting in March, officials said the economy looks good and that the inflation is expected to move up. Almost all of the officials agreed that a gradual tightening remains appropriate. The FED also said that the prospect of retaliatory trade actions by other countries as well as other issues and uncertainties associated with trade policies as downside risks for the economy. Some people are concerned among their business contracts about the possible ramifications of the recent imposition of tariffs on imported steel and aluminium. They didn`t see the steel and aluminium tariffs, by themselves, to have significant effect on the national economic outlook. Contracts in the agricultural sector reported feeling particularly vulnerable to retaliation. The stance of monetary policy will remain accommodative, supporting strong labor market conditions and a sustained return to 2 percent inflation. Some of the participants in the March meeting said that the stronger outlook for economic activity, along with their increased confidence that inflation would return to 2 percent, implied that the appropriate path for the FED`s funds rate over the next few years would likely be slightly steeper than they had previously expected. It is expected to see the rate unchanged after the meeting on Wednesday, but another hike is imminent at the following one in mid June. The next FOMC meeting took place on Tuesday this week and will end on Wednesday with any changes to monetary policy announced immediately after the meeting.